The new Republican leaders in Congress have pledged to roll back the EPA’s proposed new regulations on coal-fired power plants – a key component of President Obama’s strategy to reduce global warming. However, Republican voters are actually split in their views about climate change. A look at public opinion among Republicans over the past few years finds a more complex – and divided – Republican electorate. For this study, we combined the results from six of our nationally-representative surveys over the past three years, which provided enough data for an in-depth analysis of the diversity of views about global warming within the Republican party. We find that solid majorities of self-identified moderate and liberal Republicans – who comprise 30% of the party – think global warming is happening (62% and 68% respectively). 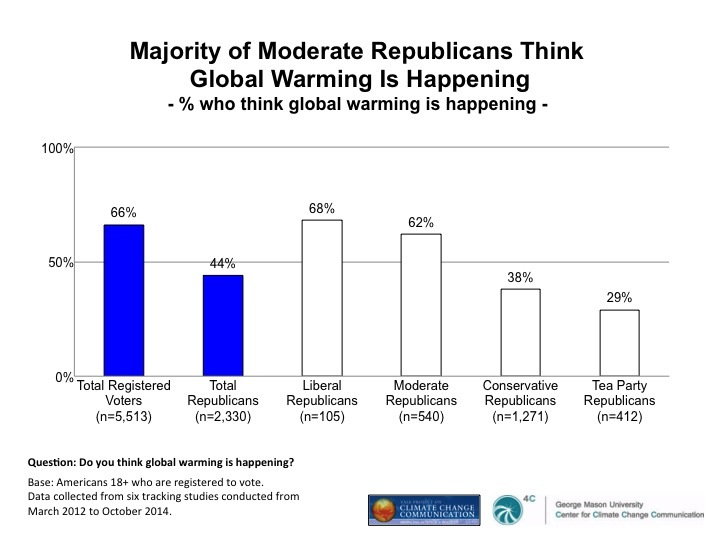 By contrast, 38% of conservative Republicans think global warming is happening. At the extreme, Tea Party Republicans (17% of the party) are the most dismissive – only 29% think global warming is happening. In contrast to the current goal of Republican leaders in Congress to block EPA regulations on carbon dioxide, half of all Republicans (56%) support regulating carbon dioxide as a pollutant, including conservatives (54%). 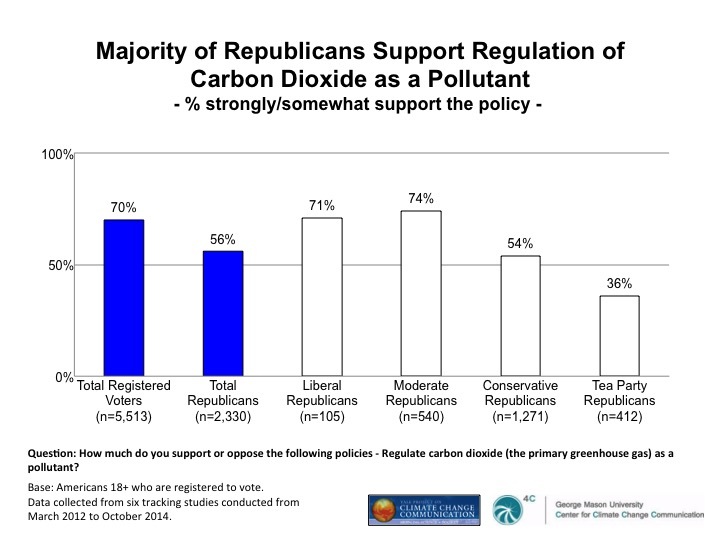 Moderate and liberal Republicans are particularly likely to support the policy (74% and 71% respectively), while only 36% of Tea Party Republicans support regulating carbon dioxide as a pollutant. 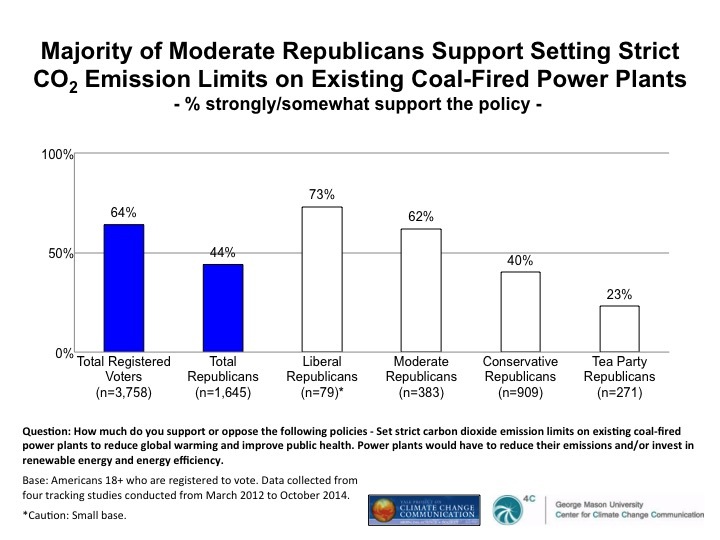 Asked more narrowly about their support for setting strict carbon dioxide limits on existing coal-fired power plants, majorities of moderate (62%) and liberal (73%) Republicans support the policy. By contrast, fewer than half of conservative Republicans (40%), and only one in four Tea Party Republicans (23%) support the policy. 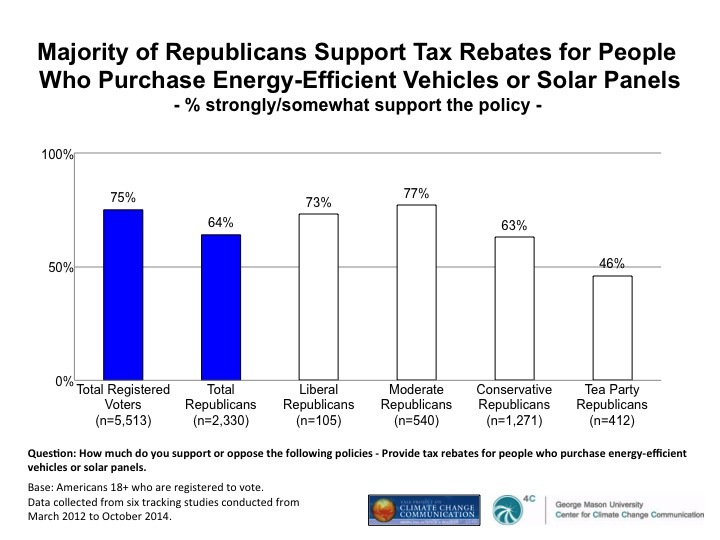 Finally, a solid majority of Republicans (64%) support tax rebates for people who purchase energy-efficient vehicles or solar panels. Moderate and liberal Republicans are especially likely to support the policy (77% and 73% respectively). But a solid majority of conservatives (63%) also support the policy. And nearly half of Tea Party Republicans (46%) support tax rebates as well. These results come from combined data from six nationally-representative surveys of American adults, which were conducted semi-annually in 2012, 2013, and 2014. Results from each of the six surveys were weighted equally to adjust for differences in sample size among the surveys. The samples were drawn from GfK’s KnowledgePanel®, an online panel of members drawn using probability sampling methods. Prospective members are recruited using a combination of random digit dial and address-based sampling techniques that cover virtually all (non-institutional) resident phone numbers and addresses in the United States. Those contacted who would choose to join the panel but do not have access to the Internet are loaned computers and given Internet access so they may participate. The sample therefore includes a representative cross-section of American adults – irrespective of whether they have Internet access, use only a cell phone, etc. Key demographic variables were weighted, post survey, to match US Census Bureau norms. The survey instruments were designed by Anthony Leiserowitz, Geoff Feinberg, Seth Rosenthal, and Jennifer Marlon of Yale University, and Edward Maibach and Connie Roser-Renouf of George Mason University. The sample consists of 5,513 registered voters, 2,330 of whom (37% of the weighted sample of registered voters) identify as Republicans or as Republican-leaning Independents. Of those, 412 (17% of Republicans) identify as part of the Tea Party movement. Of the remaining, non Tea-Party Republicans, 1,271 (53% of Republicans) identify as very conservative or somewhat conservative, 540 (25% of Republicans) identify as moderate, and 105 (5% of Republicans) identify as somewhat/very liberal. All Republicans who identified as part of the Tea Party movement were assigned to the Tea Party category. Thus, the conservative, moderate, and liberal Republican categories consist of the remaining non-Tea Party Republicans only. There were also a small number of Independents and Democrats who identified as part of the Tea Party movement who were not included in the Tea Party Republican category. October 2014: Fielded October 17 – 28 with 1,275 American adults (including 1,045 registered voters). April 2014: Fielded April 21 – 24 with 1,384 American adults (including 1,176 registered voters). November 2013: Fielded November 23 – December 9 with 830 American adults (including 669 registered voters). April 2013: Fielded April 8 – 15 with 1,045 American adults (including 889 registered voters). September 2012: Fielded August 31 – September 12, 2012 with 1,061 American adults (including 885 registered voters). March 2012: Fielded March 12 – 30, 2012 with 1,008 American adults (including 849 registered voters). For tabulation purposes, percentage points are rounded off to the nearest whole number. As a result, percentages in a given chart may total slightly higher or lower than 100%.